Get a head start training your new puppy! We offer two options for clients who have yet to bring their new puppy home and want to get a “head start” on training – Puppy Triple Play and Puppy Double Play. Puppy Triple Play is broken into three 1-hour appointments, and the cost is $300 (there is an additional charge if you live outside of Bloomington/Normal – and our travel radius is limited to 20 miles from SE Bloomington). 1. Puppy Prep: For the first visit we come to your home BEFORE you adopt your puppy to help you prepare. We can help you choose the right puppy (if you haven’t done so already), prepare your home, gather the right supplies, and assist with other details to help you and your puppy get off on the right paw from the very beginning. We provide you with a packet of educational materials to review so you’re ready when your new puppy arrives, and we cater our training to your specific situation. 2. Puppy 101: For the second visit we come back soon after your puppy arrives home to help with some preliminary training (potty training, chewing and play-biting, crate training, learning to be alone, socialization, and some basic good manners such as: coming when called; polite walking; sit/down/stay; trade and leave it; and more). After the session, we email you a thorough report which includes a behavioral assessment and training plan customized to your goals. 3. Puppy OMG: For the third visit we come back after you’ve had your puppy in your home for a couple of weeks (and reality sets in!) to see how things are going, offer strategies to fine tune your training, and provide solutions for normal puppy shenanigans all puppy-parents experience. A follow-up email is sent which summarizes the session, including training notes. If you already have your puppy in your home, we offer an extended version of the Puppy 101 consultation. 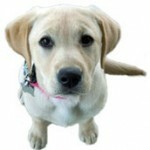 We come to your home for a 2 hour session to help you with preliminary training (potty training, chewing and play-biting, kennel training, learning to be alone, socialization, and some basic good manners such as: coming when called; polite walking; sit/down/stay; trade and leave it; and more). We leave you with a packet of helpful educational materials, and after the session, we email you a thorough report which includes a behavioral assessment and training plan customized to your goals. The cost is $200. Let us help set you up for success with your new best friend! We help set you and your puppy up for success. Any person, animal, thing, or situation you want your puppy to calmly accept as an adult—from kids to lawn mowers to cyclists—should be introduced to her regularly and in a positive way during the first 14 weeks of her life. Why? Because early socialization is essential for your puppy developing into a friendly adult dog who enjoys people, other animals, and experiences—in other words, a dog at ease in the world.